Fortunately, the brand-new GeForce GTX 680 (I really love this card!) 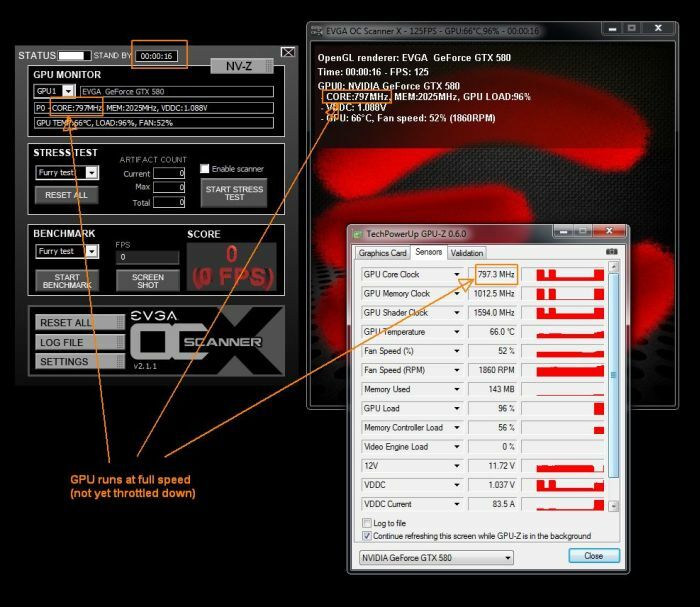 nicely handles FurMark-like applications then this short note about the throttling of the GTX 580 will be shortly irrelevant! How do we prevent this throttling? I am using 2 580gtx’s in SLI. Try the R263.09. They don’t blacklist FurMark-like apps (I used them in FurMark comp tables for the EVGA GTX 580 SC). 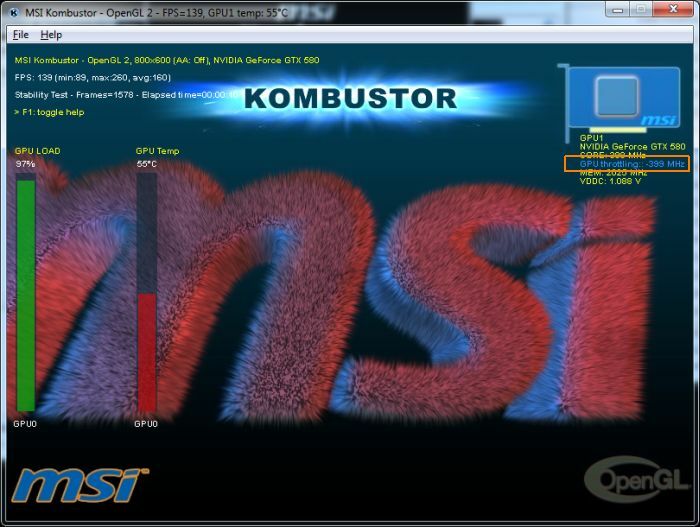 You can also use old versions of GPU-Z with the /gtx580ocp param. Here’s how I ended up on this page.. The throttling shown in FurMark tends to coincide with throttling that occurs while IN GAME, if one of the MSI Talons’ 5 LED power indicator dropping to 3 or 2 and the game running like trash. Such that it’s now easier to just run it out of SLI. Been testing both cards, swapped them around, tried them one at a time, only in SLI! So this is just happening with Furmark-like benchmark apps due to some “blacklisting” in the nvidia drivers? Has no effect on actual 3D game/simulation performance? I wonder if it’s to make the 600 series seem faster than it is in raw benchmarks. Isn’t the 600 optimized for games but each cuda core lacks the grunt of the 580? I get the same problem with my GTX 480’s. They get throttled from 800 to 400 (both cards). 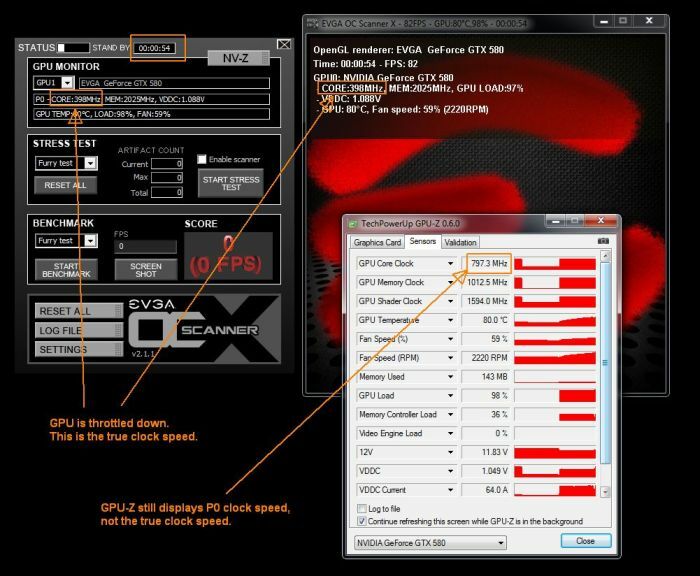 GPU=Z shows full speed but OSD shows them being throttled.